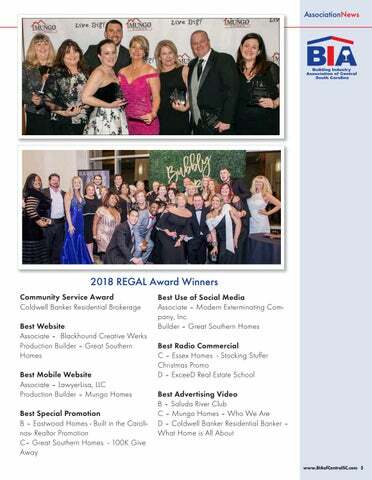 2018 REGAL AWARDS The 30th REGAL Awards Black & White Gala was held on Saturday, February 23, 2019, at the Columbia Metropolitan Convention Center. In addition to the many awards presented, attendees enjoyed live entertainment, cigar rolling, dinner, drinks and dancing throughout the evening. 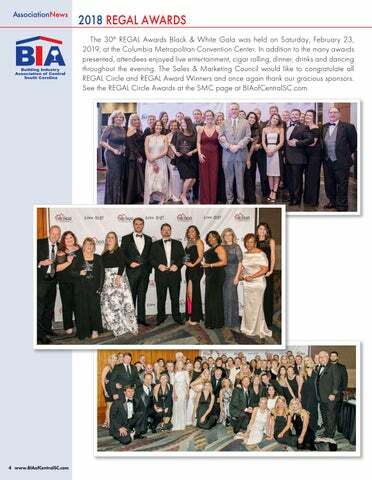 The Sales & Marketing Council would like to congratulate all REGAL Circle and REGAL Award Winners and once again thank our gracious sponsors. See the REGAL Circle Awards at the SMC page at BIAofCentralSC.com. 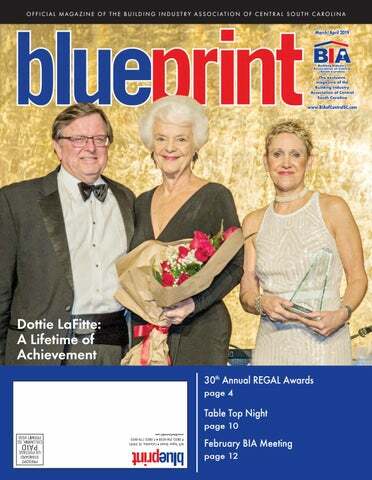 A LIFETIME OF ACHIEVEMENT Dorothy “Dottie” LaFitte received the Lifetime Achievement Award during the REGAL Awards Gala. This award, Presented by the SMC recognizes those individuals who maintain their commitment, focus and energy over a lifetime of superlative results that inspire others. In addition to presiding over her own residential company, LaFitte Custom Homes, she led others in her career through her involvement in the BIA of Central SC, HBA of SC and National Association of Home Builders (NAHB). She served as our BUILD-PAC Trustee and NAHB’s Political Action Committee since 1982 and is an NAHB Senior Life Director. She served as President of the BIA in 1987 and has received numerous awards including Builder of the Year and the Gordon A. Harrison Award. She was inducted in the SC Housing Hall of Fame in 1998. TABLE TOP NIGHT â&#x20AC;&#x201C; BIA SUPERHEROES! The first General Membership Meeting of the year was Table Top Night on January 17. Twenty BIA Members set up displays at The Oaks in Columbia for the event. Over 100 other members attended the Superhero themed event to network with each other and learn more about those companies on display. Special thanks to Newsome & Company P.C. for sponsoring Table Top Night this year. They put together a great display and treated all of the attendees to some nice bags and prizes. Congratulations to Capital Kitchen & Bath on winning the booth decorating competition. There were some really great decorations and costumes from exhibitors, but the judges selected Captial Kitchen as the winner. In addition to the fulfillment of victory, they won a refund for their Table Top fee. Our second full membership meeting of the year was held on Valentine’s Day at Seawell’s. Over 150 members and guests were in attendance for the lunch meeting. Thanks to The Building Center for sponsoring this meeting. We started off the meeting by introducing the newest members of the association (pictured above). Welcome all new members and thanks to those of you who could attend the meeting. We hope to see all of you more this year! AssociationNews An important aspect of any association is bringing in new members. We recognize those members that work to bring in new members in our SPIKE Club. The members above are either new in the SPIKE Club or have reached new levels for their continued efforts. Thank you all for continuing to grow the association! The Building Industry Charitable Foundation and Great Southern Homes/Nieri Family were pleased to make a donation to the Christian Assistance Bridge (CAB) program to help expand the Food Bank in Northeast Columbia. The Nieri Family will contribute $10,000 per year for five years to the project (pictured above). Since it was Valentineâ&#x20AC;&#x2122;s Day, we thought weâ&#x20AC;&#x2122;d share our appreciation for elected officials from Richland County including newly-elected members. We were pleased to welcome SC Representatives Beth Bernstein, Jimmy Bales, Nathan Ballentine, Kirkman Finlay and Seth Rose. Also in attendance were Richland County Council Members Jim Manning, Yvonne McBride, Chakisse Newton, and Allison Terracio. SALES AND MARKETING COUNCIL The Sales & Marketing Council of Columbia (SMC) encourages and maintains a high quality of sales and marketing expertise through educational programs, networking opportunities and recognition for its members. 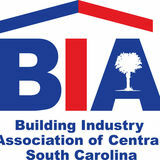 The SMC exists within the Building Industry Association of Central South Carolina (BIA of Central SC) to educate and improve the sales and marketing skills of member builders, REALTORS®, on-site sales representatives and industry support members. Mission of the Sales and Marketing Council shall be to promote a high level of professionalism through education, community involvement, and the exchange of ideas while enhancing relationships in delivering the American Dream. SCE&G Natural Gas and the Sales & Marketing Council present a series of New Home Bus Tours in 2019. REALTORS® and Real Estate Agents can take the tours for just $10 each and see up to five new home communities in one morning. New Home Bus Tour – Chapin, 9:00 a.m. REALTORS® and real estate agents only. Registration required. HIGH PERFORMANCE BUILDING COUNCIL The High Performance Building Council (HPBC) was formed in 2007 by members of the Building Industry Association of Central SC (BIA) who were interested in learning more about sustainable residential construction and who had green products and services available in the marketplace. Today, the council enjoys a membership comprised of various members of the BIA in home building, remodeling and many different trade partners specializing in all sorts of green products and services. Members meet once a month for a Membership Meeting, On-site Experience or other educational and networking meeting. The HPBC is also the certifying agent of the Certified High Performance (CHiP) Home program. The program is designed so that any home builder can pick it up and build a third-party verified, high performance home. Learn more about the CHiP Home Program at www.CHiPHomeProgram.com or contact Bin Wilcenski at the BIA Office. Members of the High Performance Building Council have met twice as of this publication. Our first meeting was held in January at Seawell’s. Members learned about using aerial photography to capture video and photos of their projects and help promote them on social media. Thanks to BIA Members Clay Walsh of CEC, R.B. Gallup of Gallup & Lafitte Design Build and Jerry Bilton of Eagle Photography, LLC (pictured above) for lending their expertise in this area for the meeting. Our next meeting was an HPBC Power Lunch held on Thursday, February 21 at Travinia Italian Restaurant and Bar in Lexington. A great crowd of builders and associates met for lunch sponsored by The Building Center. Thanks to everyone who attended! Weâ&#x20AC;&#x2122;ve got more great meetings planned for the rest of the year. See the calendar at BIAofCentralSC.com to see what happening and to register to attend. BIA Builder Members are always welcome at our events at no charge. The Certified High Performance (CHiP) Home Program recently reached a milestone 5000 homes in the program! Thanks to our CHiP Builder Partners: Epic Homes, LLC, Essex Homes, Great Southern Homes and new in 2019, Southern Traditional Homes. All homes built by these companies are CHiP Homes. Our program is designed for any builder to pick up and use to build homes more water and energy efficient, use less resources and have better indoor air quality than traditionally built homes. Make the decision to build your homes to the program in 2019 and give your customers the peace of mind that a third-party certification brings. REMODELERS COUNCIL The Remodelers Council is a group made up of members who specialize in remodeling and associated trades. Formed in 1986, the council has many long-time members and new members alike. They meet quarterly for educational meetings and in other months for social meetings and After Hours events at membersâ&#x20AC;&#x2122; places of business. In 2016, the council developed the Universal Living Certification that helps new home builders build and certify homes that are designed for inhabitants of all ages and abilities. It uses a combination of mandatory items and optional items in a checklist and a third-party verifier to qualify a new home or remodeling project for certification. In an effort to grow the program and make it accessible to more builders and remodelers, the certification parameters were revisited and reworked to make a second version of the program. Certified Universal Living 2.0 has three levels of certification where before there was only one. The first level of certification is the Bronze Level. Homes seeking this certification must have barrier-free accessibility from the outside to the inside and a barrier-free restroom on the accessible floor. This would make the house visitable to people of all ages and abilities and would achieve the Bronze Level of certification. The Silver Level of Certification goes a little further adding a full barrier free bathroom and bedroom to the accessible floor. This would make the home livable for inhabitants or visitors of all ages and abilities. The Gold Level of Certification includes the Silver Level plus a selection of optional items to help make the home even more visitable and livable. Learn more about this certification program at www.CertifiedUniversalLiving.com or contact Bin Wilcenski at the BIA Office. The 18th Columbia Remodelers Awards are coming up soon. The deadline for entries is Monday, May 6 by 5:00 p.m. Entries must be projects performed by BIA Remodelers Council members and completed between May 8, 2018 and May 5, 2019. Entry packets require before and after photos of the project and short descriptions. Judges will visit entries later in May to determine the winners. Thanks to Columbia Metropolitan magazine for their continued support of this awards program. Winners will be recognized in the September issue and featured in a Building Trends article as well. If you think youâ&#x20AC;&#x2122;ve performed award-winning quality remodeling in the past year, please contact Bin Wilcenski at the BIA Office or see BIAofColumbiaBuilders.com for the entry packet. Blueprint advertising opportunities available. Contact Bin Wilcenski at (803) 256-6238. Ask about BIA Member discounts! We’re in the offering NAHB members up to $1,000 business. NAHB MEMBERS BENEFIT FROM THESE SPECIAL OFFERS. Members of the National Association of Home Builders (NAHB) can now enjoy a private offer1 of up to $1,000 toward the purchase or lease of most new Chevrolet, Buick and GMC vehicles. Choose an eligible vehicle at your local dealer and present your NAHB proof of membership. You can add on incentives from the National Fleet Purchase Program and Business Choice to get the best value on vehicles that run your business. For private offer details, visit nahb.org/gm. 1 Private offer amount varies by model. City Express and Low Cab Forward receive a $250 Offer for both Fleet and Retail deliveries. Fleet deliveries on the Buick Enclave, Chevrolet Traverse, Silverado, Express, Suburban, Tahoe, GMC Acadia, Sierra, Savana, Yukon, XL receive a $1,000 Offer. All other Fleet or Retail deliveries receive a $500 Offer. Valid toward the purchase or lease of eligible new 2017 and 2018 model year vehicles. Offer excludes Chevrolet Bolt, Camaro, SS, Corvette, Sonic, Spark, Trax, Volt, Buick Cascada, LaCrosse, Regal, Verano, and all Cadillac vehicles. Additional GM models may be excluded from time to time at GM’s sole discretion. Customer must take delivery by 1/2/2019. Not compatible with some other offers. Not valid on prior purchases. See dealer for details. ©2018 General Motors, LLC. All rights reserved. The marks appearing in this ad are the trademarks or service marks of GM, its subsidiaries, affiliates, or licensors. BIA CALENDAR AT-A-GLANCE Here’s a quick look at what we have planned for the coming months. Please note that all dates and times are subject to change. See the calendar at BIAofCentralSC.com for the best information and login in at the site to register for meetings and events. The 30th REGAL Awards Black & White Gala was held in February 2019 to recognize Real Estate's Greatest Achievers and Leaders in the Midlands of South Carolina. Dorothy "Dottie" LaFitte received the BIA Lifetime Achievement Award in 2019 for her many years of exemplary service to the local, state and national home builders associations.